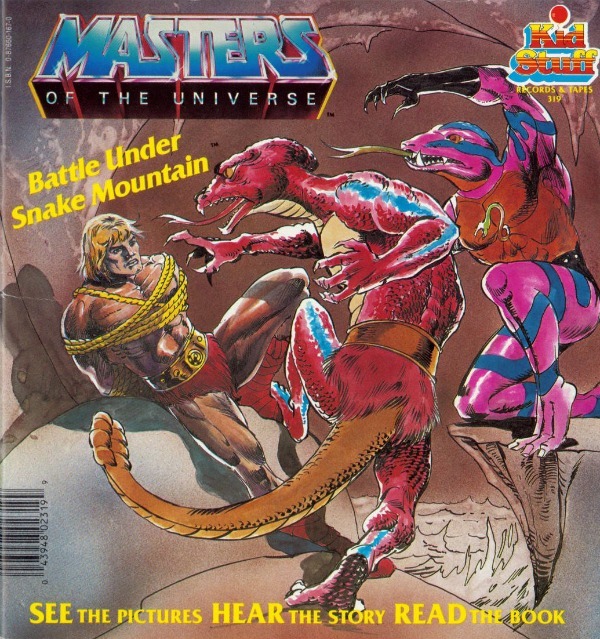 Battle under Snake Mountain is a 1986 Masters of the Universe children’s book written by John Braden and illustrated by Pablo and Judith Marcos. Here, King Hiss discovers an underground passage leading from Snake Mountain to Castle Grayskull. This was written as a read-along book, so it has more drama injected into the narrative, particularly early on. Much of the book is a lot of good setup for what seems like a solid plan – so it’s too bad that the climax involves poor execution on the part of the Snake Men (He-Man shouting to create an earthquake isn’t that impressive either). There are some canonical eyebrow-raisers going on here that will make the reader wonder if Braden was working from anything other than a pile of toys. Snake Mountain is King Hiss’s fortress, and Skeletor’s never mentioned. He-Man lives in Castle Grayskull and sleeps there (he has a He-Man bed and everything), and every indication is that Prince Adam doesn’t exist. He-Man’s also got some kind of Spider-Man-esque danger sense. The art is a strength, as the Marcoses demonstrate good attention to detail and excellent use of shading. Their characters are good-looking and faithful to the figures (even if King Hiss is a little cone-headed). The only complaint is that what Braden describes as a “giant barge” is illustrated as a tiny dinghy. In the end, a weak, predictable resolution and blatant canonical ignorance bring down an otherwise well-written story with nice art.